Cayla Ames--Alpha Chi officers April Martin, Andrew Twitty and Elizabeth Hinton help with the induction on March 29. Each semester the top 10 percent of the Junior and Senior class as well the graduate students of California Baptist University are chosen for a special honor, to become inducted into Alpha Chi. 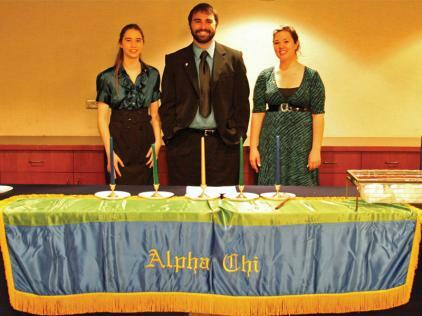 Alpha Chi is a national college honor scholarship society. This semester a total of 65 students were chosen to join based on their academic standing, adding to the thousands that are already members of this society both at the University and nationwide. The induction ceremony was held on March 29. It celebrated the induction of 32 new members into the Beta chapter as well as having over 10,000 new members into the society overall. CBU’s Beta Chapter President Elizabeth Hinton was very excited for the induction ceremony. were three of us to inducting more people” Hinton said. The event started out with a welcome speech by Dawn Ellen Jacobs, associate provost and professor of English and then participants dined before the procession started. Associate Professor Amy Stumpf delivered a speech that was meant to inspire not only the inductees but also everyone in the room to strive to do good things in love of Christ. Following Professor Stumpf’s speech, Alpha Chi’s Beta Chapter Vice President of Communications Andrew Twitty and Vice President of Events April Martin explained to the inductees how to communicate with each and he encouraged them to participate in the events that would take place in the future. Then the inductees lined up in the hallway while the officers got ready to welcome the new members into the society. One by one they were called into the room. They signed their name in the membership book, recited the pledge for Alpha Chi and lit a candle. At the end, they were greeted by Provost Jonathan Parker. Finally, once all of the students were inducted into Alpha Chi, they were instructed to repeat the motto “You Shall Know The Truth and The Truth Shall Make You Free” from the Gospel of John and then were instructed to blow their candles out. One inductee, Jacquie Lutz expressed her feelings about the evening. Rebecca Martin, another Alpha Chi inductee was not only excited to join the Honor Society but was also because of her sister, April Martin, who is an officer in Alpha Chi. “I’m happy to join but I’m also excited because now my sister and I have something else that we share in common” Martin said. Alpha Chi was founded on Feb. 22, 1922 and has since grown to have over 100 chapters. The Alpha Chi chapter on the CBU campus is the California Beta Chapter 94. According to the Alpha Chi website, the motto is taken from the Gospel of John, “You Shall Know The Truth And The Truth Shall Make You Free” from John 8: 32 of the King James Bible.